Thankfully, my other half likes discovering new places just as much as I do (win!). We decided to check out what’s new in Midtown. We strolled by the always buzzing Sugarcane and saw that its neighboring restaurant, Mercadito had closed! When did that happen?? Oh well. 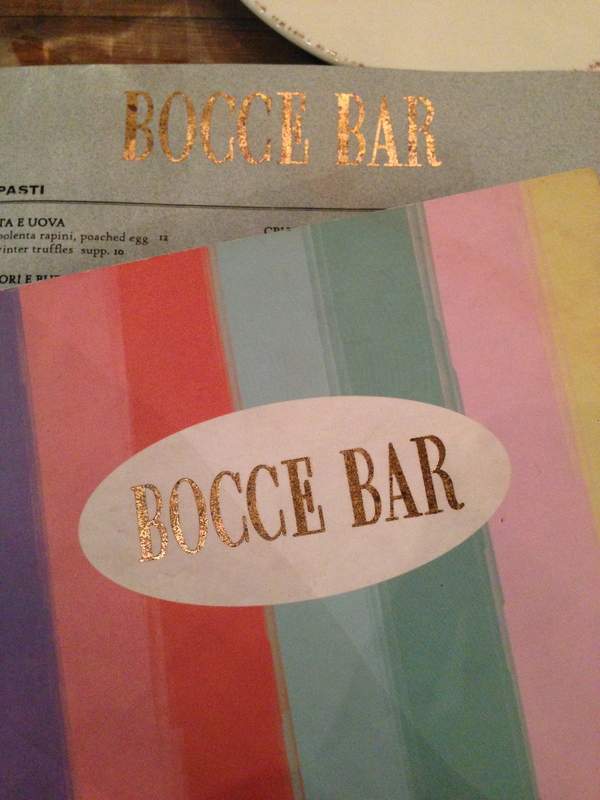 A couple of more vacant, dark spaces followed and then we stumbled upon Bocce Bar. It was filled with people and looked attractive from the outside, so why not? The staff was very polite and attentive and sat us at a cozy table for two. The restaurant had a nice layout as well. I could see from my chair an open kitchen at one end and a nice bar to the side of the restaurant where you could wait for a table while sipping a drink. They also had an outdoor eating area equipped with a few small tables. What I really liked was the restaurant’s airy feel due to it’s long doors and windows that they kept open. They offered us a baguette, accompanied by olive oil and a special spread. It’s amazing how the simplest foods make me the happiest 🙂 Dipping bread into olive oil and drinking red wine is just so awesome (…cue the angelic music…). But of course we can’t forget the appetizers and main course. 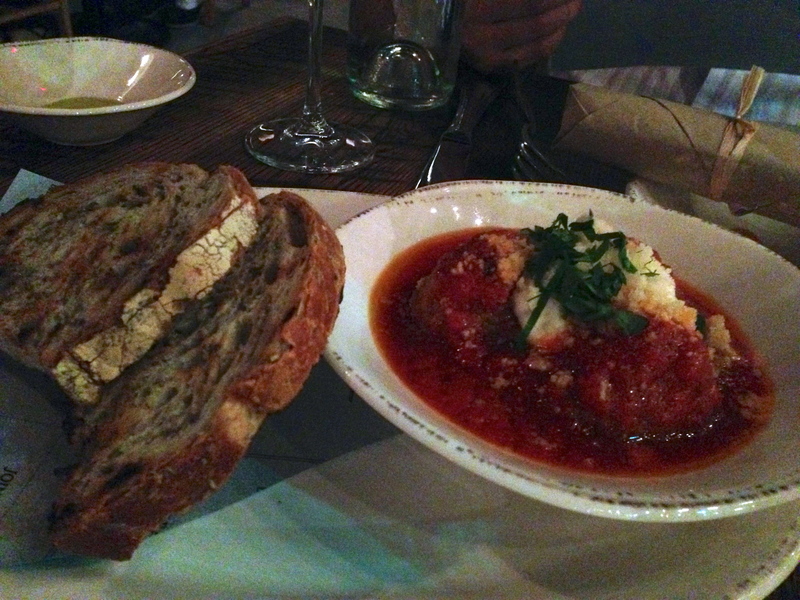 First, we ordered the polpette d’agnello, which is lamb meatballs with goat cheese and crostini. It was delicious. The meatballs didn’t really taste like lamb, more like regular ground beef and they were also super soft and tender. The crostini (grilled/toasted bread) was flavored with herbs and olive oil and I dipped it in the remaining tomato sauce (of course). Next, was the polipo grigliato, which is grilled octopus, ceci bean puree and olive caper vinaigrette. I like the grilled octopus, however, I could do without the puree (yellow sauce surrounding the octopus). It was overpowering and reminded me of the flavors of dijon mustard. Personally, I prefer grilled octopus with a lighter sauce, something on the acidic side that doesn’t overpower the octopus itself. For our main course, we shared the cannelloni di coniglio, which is florida rabbit in cannelloni pasta with spinach and parmigiano bechamel. I know what you’re thinking…rabbit??? Yes! I like trying new things and ordering dishes that either I can’t make at home or can’t find in most places. The actual rabbit meat inside the cannelloni was shredded and tender. The pasta as well tasted authentic, definitely fresh pasta. I would recommend trying this dish, it was actually simpler than I thought as some cannelloni dishes are drowned in cheese and sauces. This one was simply prepared and let the ingredients speak for themselves. Lastly, we skipped dessert (diet time :/) but we were pleasantly surprised when they gave us homemade marshmallows with the check (yay!). They were so fluffy and soft, it was a great touch!